Berkshire Hathaway HomeServices, an HSF Affiliates LLC company, announced that the Berkshire Hathaway HomeServices real estate brokerage network ranked “Highest Overall Satisfaction for Repeat Home Sellers Among National Full Service Real Estate Firms” in the J.D. Power 2017 Home Buyer/Seller Satisfaction StudySM. The network has a local presence at Berkshire Hathaway HomeServices Verani Realty, which serves New Hampshire, Massachusetts, Maine and Vermont. The 10th annual study measured customer satisfaction among the nation’s largest real estate brokerage companies and their agents through March and April. Overall satisfaction was gauged across five factors of the real estate process: agent/salesperson, closing process, real estate company marketing, real estate company office, and package of additional services. The study was based on responses from 4,170 consumers. The 500 real estate agents in the Berkshire Hathaway HomeServices local network represent Verani’s 50-year reputation for excellence and community engagement. Verani, which has sales and marketing centers in 14 locations throughout New England, was recently named the “Fastest Growing Family Business in New Hampshire” by Business NH Magazine readers, among other accolades, due in part to its growth rate of more than 18 percent. Among repeat home sellers, Berkshire Hathaway HomeServices scored 858 on a 1,000-point scale, performing particularly well in the categories for agent/sales person, closing process and real estate company marketing. Gino Blefari, CEO and president of the network, discussed how the ranking speaks volumes. An agent’s relationship with a buyer is the most important factor in determining customer satisfaction. For sellers, marketing of the home is the most important factor, as it is the most visible way for the seller to gauge the agent’s support. Satisfaction is strongly influenced by the amount of time agents invest in keeping customers informed vs. when they are not kept informed. Among first-time buyers and sellers, satisfaction is 117 points higher among buyers and 93 points higher among sellers. Among repeat buyers and sellers, satisfaction is 210 points higher among buyers and 192 points higher among sellers when they receive a timely response to questions and concerns vs. when they do not. Word-of-mouth remains important: First-time home buyers and sellers report good reputation and recommendations from friends, family and colleagues as the two main reasons for selecting a real estate company. Berkshire Hathaway HomeServices received the highest numerical score among five real estate companies for repeat home sellers in the J.D. Power 2017 Home Buyer/Seller Satisfaction Study, based on 5,117 evaluations from 4,170 consumers, measuring the perceptions and experiences of people who bought and/or sold a home between March-April 2017. Your experiences may vary. 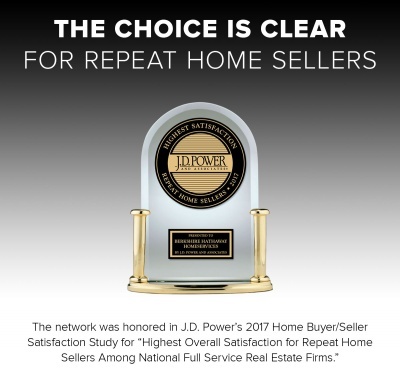 Visit http://www.jdpower.com/resource/us-home-buyerseller-satisfaction-study for details. Berkshire Hathaway HomeServices, based in Irvine, CA, remains one of the nation’s fastest-growth real estate brokerage networks with 43,500 agents and 1,320 offices named to the brand since its launch in fall 2013. The network, among the few organizations entrusted to use the world-renowned Berkshire Hathaway name, brings to the real estate market a definitive mark of trust, integrity, stability and longevity. Visit www.berkshirehathawayhs.com.